170 watermaker. 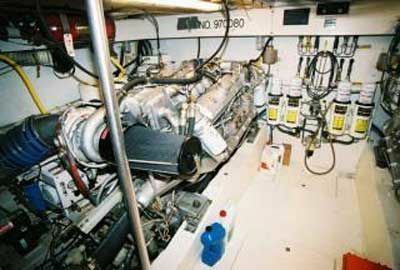 The position makes it difficult so see the gauges, let alone change the forward filter that cannot even be seen. We are removing it from this location to find a better spot and since it clearly has not been used in at least a year we will have it checked out. 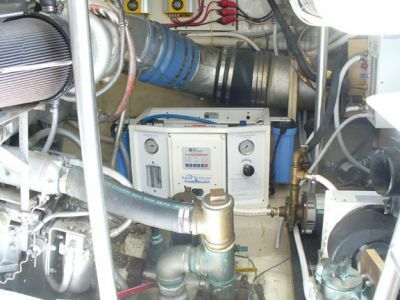 It was determined that the preveous owner had neglected the older Crystal Sea Series unit allowing the membrane to dry out among other items being abused and making repair a costly expense for the older unit that would produce 170gal per day. The caliber this vessel has become dictated an up-grade! A "Aqua Whisper" from Sea Recovery was aquired offering many atvantages not found in the past and having the ability to make almost 30galper.hr. or 700gal.per.day. The new unit promises to be easy to use and can be integrated into the e-plex system for automatic on-off determined by the storage tank fill gauge. Even though the new unit produces nearly four times as much water, it's size is compact. 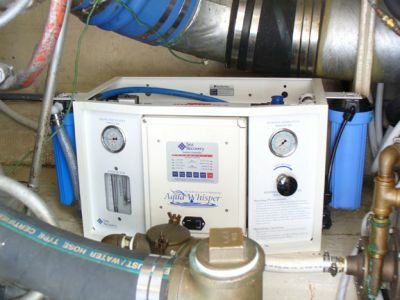 Water produced from this unit is the best possible to use for: 1. Shampooing Stacey's hair, 2.Washing the EZ2CY Enclosure, 3. Washing the boat, 4. Perfect coffee in Brew Express, 5. Perfect ice from "Raritan Icerette" for my Scotch, 6. Perfect for Eskimo machine 7. Etc., Etc. The pure soft water available with the Aqua Whisper is a paramount achievemnet. This water will not spot the enclosure, will not spot the paint or be corrosive to anything on the boat. Amazingly, this pure water can be produced from almost any harbor we visit and is a valuable asset in most.